Michael: Notice the base of the palm resting on the strings. You might need to adjust the amount of pressure on the strings to get the desired sound you're trying to achieve. Michael: Now try adding licks between the palm-muted rhythm patterns. Michael: Now try playing a rhythm pattern where you mute the single notes licks as well. 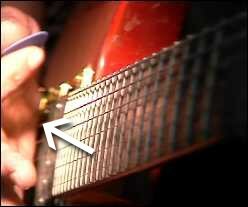 You need to adjust your palm to cover the single strings as you play them. Michael: Now let's get down to the real meat of the Metallica speed sound. Try playing the muted E5 chord using muted alternate picking, we'll build on the speed later. Michael: Try to rest the palm on the strings and use the wrist as your pivot point for moving your hand. Also angle your pick slightly to get a better attack on the strings. Slowly build up your speed, it takes time, but believe me it's well worth the time you practice! It'll make all the difference in you playing. Here's a few jam track you can practice over. I'll give you 3 speed variation so you can build up over time. Michael: Now remember, be patient! It takes time, try practicing as much as possible and at various speeds. I use to watch TV or listen to the stereo and practice with my guitar unplugged all the time. Try to focus on other things outside of what your hand is doing, this will help your hands develop muscle memory and your picking will become more automatic where you can focus on what your fret hand is doing.